The American Council on Education (ACE) is a U.S. higher education organization established in 1918. Located in Washington, DC, it comprises approximately 1,800 accredited, degree-granting colleges and universities and higher education-related associations, organizations, and corporations. The organization conducts public policy advocacy, research, and other initiatives related to key higher education issues and plays a significant role in higher education leadership development. ACE's President since 2008 is Molly Corbett Broad. Broad announced in January 2017 plans to leave her post on October 31, 2017. The board chair is Judy C. Miner, chancellor of the Foothill-De Anza Community College District (CA). Immediate past chair is John J. DeGioia, president of Georgetown University(DC). The vice chair is Barbara R. Snyder, president of Case Western Reserve University (OH). The secretary is R. Barbara Gitenstein, president of the College of New Jersey. The Council developed and administered the General Educational Development testing program until 2011 when it entered a collaboration with Pearson to form the GED Testing Service, which now is the sole developer of the test. The GED test measures whether a person has the academic skills and knowledge expected of high school graduates in the United States or Canada, thus allowing adults who lack a high school diploma to certify that they possess the equivalent of a traditional high school education. 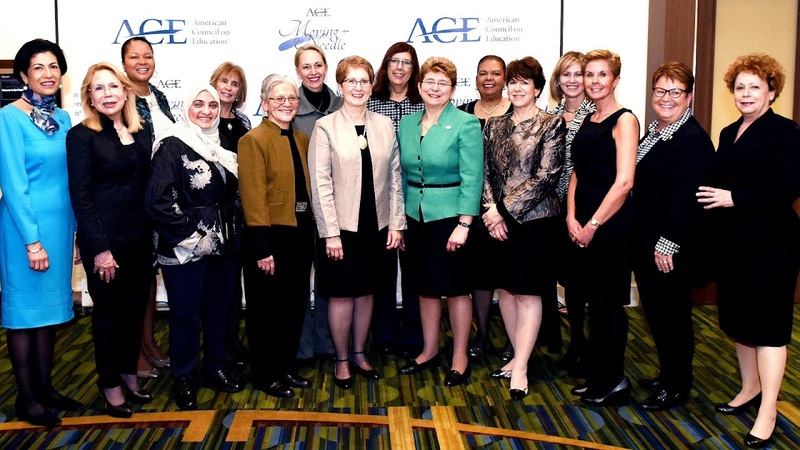 Since 1965, hundreds of vice presidents, deans, department chairs, faculty and other emerging leaders have participated in the ACE Fellows Program, which prepares senior leaders to serve American colleges and universities. ACE's Higher Education for Development (HED) program supported the worldwide development goals of the United States Agency for International Development (USAID), primarily by coordinating the involvement of the U.S. higher education community in addressing international development challenges. HED ceased operations at the end of FY15. ACE, Lumina Foundation for Education and the Ad Council launched the KnowHow2GO campaign in January 2007. This multiyear, multimedia effort includes television, radio and outdoor public service advertisements that encourage 8th through 10th graders to prepare for college using four simple steps. Since 1945, ACE Military Programs have provided a collaborative link between the U. S. Department of Defense (DoD) and higher education through the review of military training and experiences for the award of equivalent college credits for members of the armed forces. Registrars, admissions officers, academic advisors, career counselors and DoD Voluntary Education professionals have a basis for recognizing military educational experiences in terms of civilian academic credit through the Military Guide Online. In 1918, 14 higher education associations formed an emergency council to ensure the U.S. had a ready supply of technically trained military personnel in World War I. In July, it adopted the name "American Council on Education" and invited institutions of higher education to join the Council. 1942: ACE spearheaded the development of the GED program and the Military Evaluations Program for veterans who left school to serve in World War II. Two years later, ACE advocated the passage of the Servicemen's Readjustment Act (also known as the G.I. Bill) to provide education benefits to veterans. 1948: Along with the Carnegie Foundation and the College Board, ACE founded the Educational Testing Service. 1953: ACE, along with the National Association for Women in Education, established the Commission on the Education of Women to examine the role and levels of participation of women in higher education. 1962: ACE formed the Committee on Equality of Educational Opportunity in response to issues raised by the integration of the University of Mississippi. 1963: ACE helped found the Washington Higher Education Secretariat. 1965: ACE was instrumental in the development and passage of the Higher Education Act of 1965, which funds most higher education programs, including student aid. 2003: ACE files an amicus brief to the Supreme Court in support of the University of Michigan during the affirmative action cases. 2008: ACE was instrumental in the passage of the new Post-9/11 GI Bill.